This deluxe 1-bedroom condo on stunning Grace Bay, cited by Conde Nast as the most beautiful beach in the world, will have you coming back year after year. The twelve miles of beach and warm turquoise waters, breathtaking sunsets, and the sense of a stress free stay, has the Turks & Caicos rated a number one vacation destination. I want you to have a great dining experience, so we do recommend trying the off site local hotspot restaurants, including the Mango Reef, Coyoba, PAVILION at the Somerset, and many others! We provide our guests with a lovely & complimentary welcome basket. Bountiful Rum Punch Cocktails , as well as Breakfast Groceries for your stay, when you book a week long stay! This is a MAJOR bonus, and will get you out on that beach all that much faster upon arrival. You will find this unit roomy, comfortable, and accommodating. The unit is still like new, and just sparkles with extra touches. Whether you go to the local IGA grocery store not far from the property (3.3 km/5 minute drive) and play 'Iron Chef' for your stay, or dine at one of the many fine local and easy to get to eateries for a gourmet delight, you will be equally happy. All of this at about one third of what you would spend if booked elsewhere. Our VRBO Unit is NOT "all inclusive", so you save a ton and have the flexibility to enjoy great restaurants on island, many within walking distance, and save by cooking in and fixing your own perfect cocktails when you feel like it! Book a deep sea fishing trip, parasail, do some snorkeling or scuba, or visit the local horseman down the way for a romantic evening ride on the beach.....or, just do nothing and relax with that well deserved Pina Colada you have been yearning for! Either way, you will hope this vacation never ends! We are so excited to be able to include so many extra amenities via the VIP CLUB, that are only offered when you book through VRBO. Not only are you getting a significant discount but you are also getting an improved experience by booking through us directly. Lots of awesome perks and all beautiful new beach amenities, superior sports equipment, and yes...a "Beach Butler" to tend to your comfort while on the the most amazing beach in the world! You will never-ever have to reserve loungers & umbrellas as we have ample! It's all a short flight away. From most areas the flights are non stop. 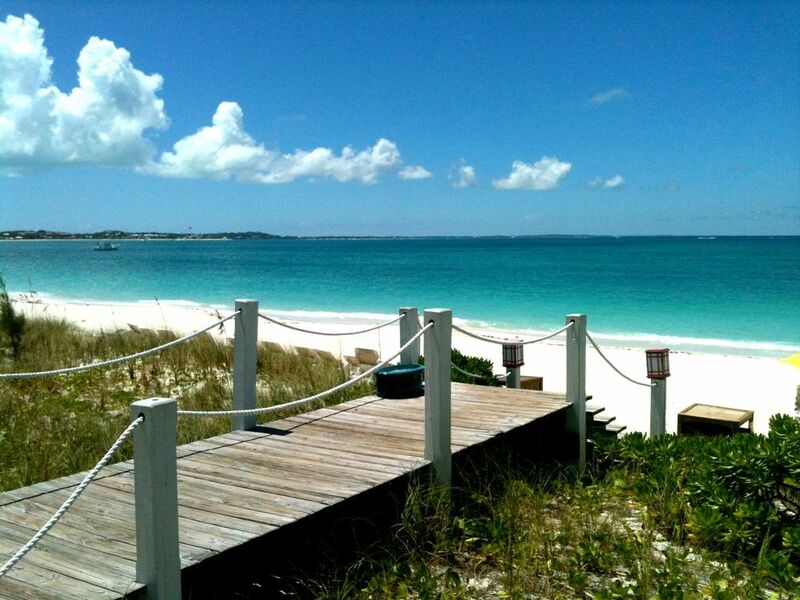 The Turks and Caicos is perhaps the easiest Caribbean island to reach from the U.S., Canada, and England. Contact us via email or telephone below, (we are on what's app!) and start getting excited about one of the most memorable vacations you will ever take. The airport (PLS) offers a large open air check-in hall with the added convenience of self-serve kiosks, a fully enclosed and air-conditioned security checkpoint hall, new shops and boutiques, and an outdoor viewing terrace on the second floor of the airport. Originally from the the east coast (the great state of new York), as well as the "left coast" (We love San Francisco! )...we fell in love with the Turks and Caicos on a vacation years ago, and decided we just had to have a piece of this paradise for our own! This is a resort that is not congested at all and has one of thee most vast beach front areas! The one bedroom deluxe unit is more "side to side" as opposed to "front and back" so you get an awesome view from both the living areas as well as the master bedroom! The minute we got off that plane and heard the warmth of the steel drums, we knew we were in the best place possible for a relaxing vacation. Waking up each and every morning to the light sounds of the waves touching the sand and the balmy breeze is something that makes you really enjoy life! LUSH EMBROIDERED VIP BEACH TOWELS TOO! GYM AVAILABILITY IN THE MARILYN BUILDING JUST ACROSS THE WAY. VERY LARGE FOR LOUNGING AND DINING! 2 Beachcomber Bikes specific for our unit. Codes for locks will be given prior to check in. Not far, the Provo Golf Course has one of the nicest course's I've seen. Just wonderful! Some restrictions to pool usage now apply as of April 1, 2016. Please contact owner for details. Resort pool lounges are reserved for those who book through the resort directly. I cannot overstate enough...the pool is always available to our guests, however, the resort has purchased pool lounge chairs that are reserved for only those who have booked through the resort/all inclusive...but, it is all about the BEACH on Grace Bay!!! There is nothing like TCI.......we spent a week here and feel like our souls have been rejuvenated. This was our fourth or fifth year going to TCI and it just never disappoints. The beach is second to none, the accommodations are great, the food is great. We rented a one-bedroom unit and things went very smoothly from start to beginning. Cant say enough good things about our trip. The Alexandra Resort is beautiful and this unit is ideal, on the second floor with an expansive balcony overlooking the pool, courtyard and the ocean beyond. We spent many mornings there with coffee and evenings with a pre-dinner drink. The unit is spacious and has high ceilings and lots of natural light. It’s clean and modern and had everything we needed. The kitchen is stocked with cookware and utensils. And yes, there’s a blender to make pina coladas! Elen, the property manager, was the most gracious host, from the time we booked all the way through our stay. She answered every question by e-mail and/or What’s App (usually within minutes of asking) and she went above and beyond to provide travel and sightseeing advice for the island. She gave us recommendations and detailed lists for restaurants, excursions, car rental and much more. And her tips were spot on. Elen also left a wonderful welcome basket for us that included some breakfast and snack items and some local rum. They served us well throughout our week stay. She also advised stopping at the local IGA and stocking up on a few items, which we did. As VRBO guests at the resort, you don’t have access to the all inclusive benefits of the restaurant and beach bars, so the groceries are key to enjoying your time on the beach. Most other VRBO guests we met at the beach (there’s a separate VRBO area with lounges and umbrellas and two terrific beach butlers – Gideon and Joshua) really enjoyed that independent aspect, as did we. A few more tips to get the most of out of your stay: the pool is excellent, especially in the morning when it’s shady – VRBO guests can’t use the lounge chairs but can indeed swim in the pool; rent a car – the convenience is worth it and, bang for buck, probably beats the expensive taxis; that said, the vast majority of your time, as Elen advised, will be on Grace Bay, so walk to and from nearby restaurants along the beach if you can. This condo was a perfect vacation home! It was clean, well maintained and a perfect location! We loved staying at this property for our week long, 30th anniversary celebration at the TCI! It is a warm and welcoming place, beautifully appointed and had many extras! Elen was very welcoming and hospitable! Elen responded to our questions immediately although we had few questions because she provided so much pre-trip information and recommendations! The cocktail gift basket and the "starter" foods provided were the perfect welcome! We enjoyed the bikes, snorkel equipment and kayaks that were available to us. We didn't even go near the pool because the draw of the amazing beaches were why we were there! Joshue and Gideon were very friendly and accommodating beach butlers. The lounges and umbrellas on the VIP section of the beach were plentiful. There were very few people at our section of the beach. The beach towels provided to us were of the highest quality! We rented a car for the weekend and we enjoyed trying different restaurants every night and we frequented the casino after dinner on numerous occasions. We didn't have a bad meal the entire week! On Elen's recommendation, we went to Sapodilla Bay Beach and rented jet skiis through Tropical Waves. We were given a nice discount and the guys working there were so friendly! After our ride, we enjoyed a free cocktail and use of lounges and umbrellas at this quiet, beautiful beach that was not "touristy"! We also traveled to Taylor Bay to catch a stunning sunset. We were alone on the beach. Renting a car is highly recommended! As a rule, we don't go to the same vacation spots more than once. There is much to see on the amazing planet but this was by far our favorite island vacation and we would certainly entertain returning! Especially this time of year as we shoveled snow the morning we caught the plane for paradise. We would absolutely stay at this property again. It exceeded every expectation and Elen was the perfect hostess! I felt like I was dealing with a friend during the planning process and in this day and age when customer service is not necessarily a priority, we were made to feel very special. That just enhanced our wonderful memories of this first rate vacation! I can’t say enough about this beautiful condo! Everything was perfect from the moment we opened the door. The owner welcomed us with a basket of groceries that were perfect! The condo is beautifully appointed and has everything you could possibly need for your stay. The gorgeous beach is only steps away from your door and the complex is perfectly located close to town and an array of fabulous restaurants. If I could rate this any higher I would! We just spent a week at this beautiful, clean and well stocked condo at the best location on Grace Bay beach. Easy checkin/checkout and the owner was more than helpful with recommendations. I would definitely recommend this condo to anyone! On site Tennis Court, beachcombers, and snorkel equipment! *VERY IMPORTANT TO NOTE THAT WE, AS OWNERS, PAY ALL VIP CLUB FEES. MOST OTHER "LIKE" PROPERTIES DO NOT* The fees that we don't pay would be any credit card, international fees, etc., that are taken out of our GROSS rent at the beginning of the transaction. We would collect those out of the damage deposit at the end of your stay, and clearly state that these are fees NOT collected for damage, but rather the incidental 2-5%-3.75% of the credit card, int.fee charges. We must GROSS the stated rent as per page three of the contract. Reservation will not be booked w/o both fully executed contract & receipt of deposit. The exit cleaning fee of $125.00 is extracted from the $500.00 deposit held at time of booking. *The dates of Dec 21-Jan 4 are priced at $440.00 per night* We will do a minimum 7 night or minimum 10 night stay. The stay must start or end on a Saturday. This may be subject to change, so please send your inquiry and ask :) **If doing an instant booking, please wait to have owner's approval before booking airlines, etc., as especially during high season, we must have full week and typically "Saturday to Saturday" bookings** *It is the owner's discretion to adjust pricing due to #/age of guests. Typically there is a $100.00 fee over two persons.